We suggest revising the Fall of Roman Empire this week. No doubt, you remember that the Roman Empire was a government headed by emperors occupying a territory around the Mediterranean Sea in Europe, Africa and Asia. The Roman Empire left an imperishable trace in all European lands, wherever the victorious roman legions stepped in while the stone ligature of Roman architecture survived to this day. 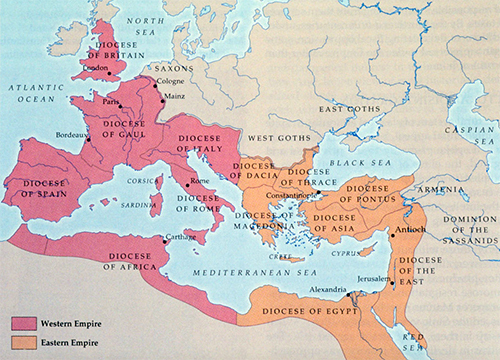 In 285CE Roman Emperor Diocletian ordered to divide the Roman Empire in two halves: Western Empire and the Eastern Empire or Byzantium. But what made the emperor to make such a decision and what brought to the Fall of Roman Empire in 476CE? An analysis of political, social, economic and military reasons of the Fall of Roman Empire by Kristin Glaeser – world history teacher at a middle/high school in Charlotte, will help you to gain a deeper insight into the history of the word’s greatest superpower.